What do you think ? Any possible enhancements to this setup ? 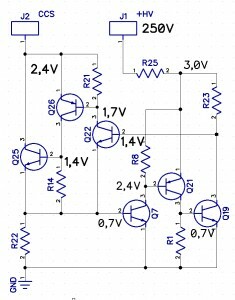 The reasoning is as follows: I want to achieve a “low dropout”, if I may say so, in the sense that relative to ground, the voltage on the upper transistor Q22 could be hopefully as low as 1,7V and that the CCS would still function correctly. 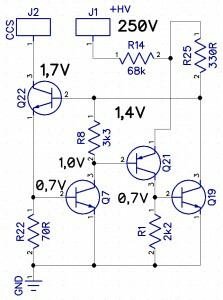 The current is set by the R22, at roughly 0,7V / 70R = 10mA, but other values of the programmed current should be also possible. The Q7, Q21, and Q19 serve as a high gain, doubled up Sziklai configuration. Should the current flowing through the R22 be higher than it should be, that would correspond to an increase of base-emitter voltage of Q7, which would start to conduct more. This, in turn, would “turn on” the Q21, so that it too conducts more. That, in turn, triggers the Q19 to conduct more. Effectively, as a result we should be looking here at a very high, compound gain of these three transistors. 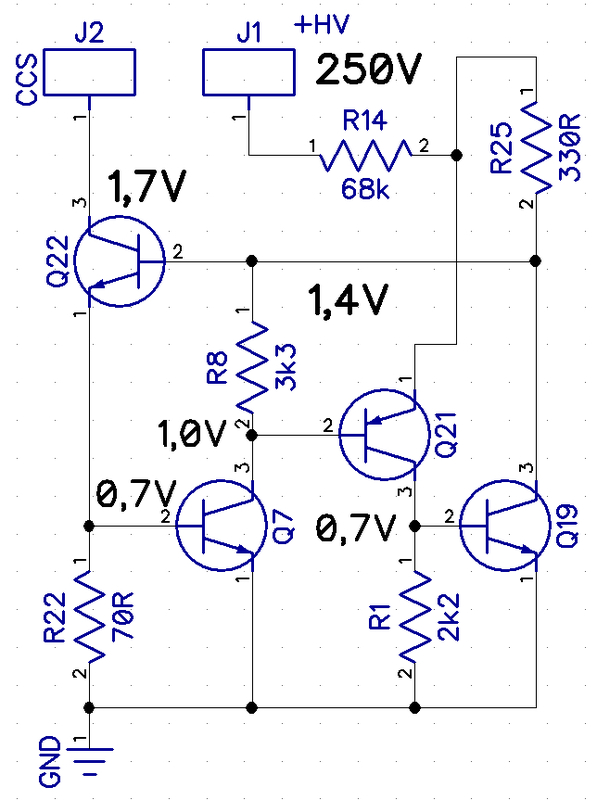 The net result is that they jointly work so as to pull down the voltage on the base of Q22. This in turn tempers it’s conduction a bit, so that the current flowing through R22 decreases and hence returns to the programmed value. As the CCS shall be intended to be used as a sink for some tubed long tail pair (LTP), it was a primary concern to keep the CCS “dropout” voltage at a fairly low level, hopefully the 1,7V, as this seems to be a fine voltage offset for may an input vacuum tube in terms of the bias. The R14 is connected to a high voltage, which may be easily found in a tube amplifier. This method of biasing the base of Q22 via a high valued resistor from a high voltage is supposed to achieve a high gain in the compound transistor circuit Q7, Q21, and Q19, where all three of them jointly act as an ultra-high-gain shunt to ground, a shunt that provides tight control of the voltage on the base of Q22. 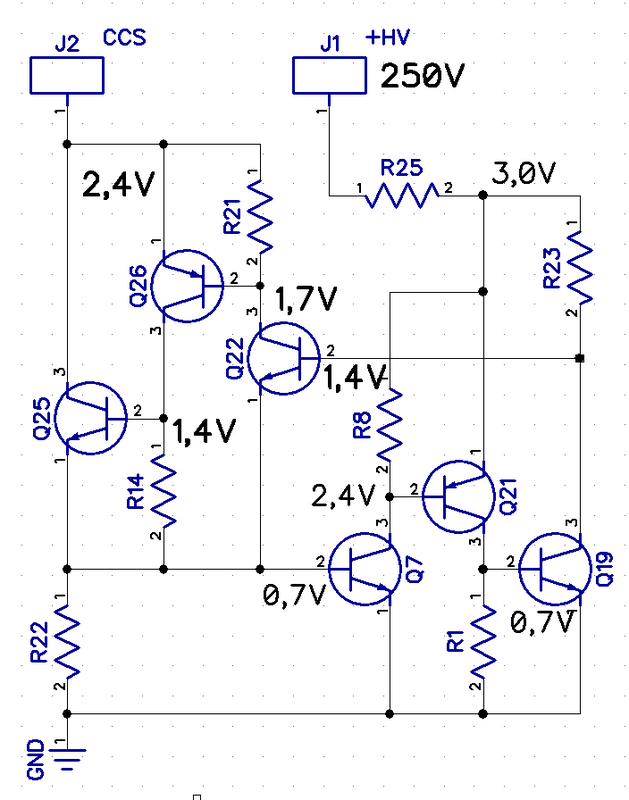 I previously had a slightly more complex version of this circuit in mind, as below, but after some consideration – came to the conclusion that it would be lacking the “low dropout” feature, which is definitely a handy attribute when considered in the context of tube cathode bias. Originally, it was to be equipped with massive loop gain, but unfortunately the “CCS” pad at the top left corner seems to be requiring a minimum operational voltage of about 2,4 Volts, which would be a no go in case of some of the input stage vacuum tubes, which normally require a bias of a lesser voltage. But if we were willing to reference this CCS variation not to ground potential, but say to a fixed voltage of say -12 Volts, then, this too could turn out to be a nice option. Your comments – kindly appreciated.